"Abandon all varieties of Dharma and just surrender unto me. I shall liberate you from the consequences of all your sins. Fear not." Lord Krishna. While summarizing Bhagavad Gita, Bhagawan Sri Krishna says that Arujuna should forget all the principles and simply surrender unto the Lord. According to Bhagavan Krishna, whatever principles and practices that one follows should be given up and total surrender should be made to Krishna. Abandoning all principles and possessions that one holds dear and surrendering to the Lord is the highest order, called Bhagawada Dharma. Krishna further says: “Renounce everything that you consider precious in this world and surrender unto Me. I shall then safeguard you and protect you. There is nothing to fear”. Here, we need to study Lord Krishna’s statement a little more deeply and understand its true meaning. Every one of us has a specific duty to perform in this world according to our position in the social order. In the second chapter, 47th verse, Krishna has clearly stated that we have the right only to perform our prescribed duties but we are not entitled to the fruits of our action. Therefore, we should consider ourselves as mere tools. It is the Lord who conducts and manages the universe. He takes the responsibility for the welfare of all, just as a father takes responsibility for the welfare of his children. What we are expected to do is to merely do our duty and leave the rest to God. We consider our family relations very precious. Of course, family relation is the very basis of life. We are not expected to renounce family relations and possessions, cherished for many years. What is expected of us is not physical renunciation but mental renunciation. Let us do everything for the welfare of our family but let us not be attached to the family. An actor performing the role of a king would always be conscious that he is just an actor and not a king. Similarly, even while performing our family duties, we should be always conscious of Krishna. Though we may be doing many duties for the welfare of our family and society, our mind should be detached from it all. 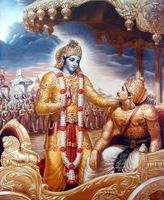 Mentally, we should always be surrendering to Bhagavan Krishna. True surrender means not renouncing everything that you hold dear but renouncing your individuality; your ego. When we talk about surrender, it is Sri Ramana Maharshi who immediately comes to mind. 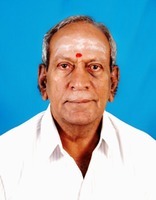 He left his dear mother, his relations and the comfort of his home and set out his journey to Tiruvannamalai. He never knew where his next food would come or where he would get the shelter. He did not keep anything for himself and totally surrendered to Arunachala. Having surrendered, see, what a great spiritual leader he has become. He then attained the highest spiritual end, self-realization.